You will get a thorough Adirondack ski report if you read this entire blog post. Earlier today, I was driving from town to my home on Cascade Road, which is really State Route 73, outside of the Village of Lake Placid in upstate New York. My friend, the more observant one of the two of us, remarked, " Geez, look at all those cars in front of us, stopped, on this 55 mph highway. There must be an accident." I thought perhaps the famous Cascade Cow Moose had been hit since traffic was at a complete standstill, with cars catawampus across the entire two lanes. As we came closer to the stopped vehicles I noticed many of the cars were empty, but with their engines running. People were stopped and out of their cars, pointing and taking pictures of the featured female. It was a dangerous situation. I was moving pretty quickly when I came upon the line of traffic. There was no warning that there were stupid people ahead; no flares sparkling or lights flashing. I will control myself and restrain from noting which state(s) the license plates revealed host the most morons. 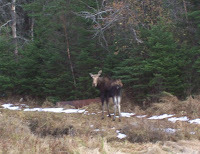 We love having visitors to the lovely Adirondack Park, but it is not really a park. I've tried to explain it here in the past. I can totally relate to how cool it is to see a real, live moose; I didn't see many meese in South Jersey when I was a little girl. But, come on, please use your brain and be careful. Here's the 2008 Adirondack Thanksgiving weekend ski report I promised: we are enjoying awesome early skiing conditions! Whiteface was very good yesterday. The snow making mavens did a marvelous job and the trails were beautifully covered with nicely groomed, dry snow. The cross-country skiing at Mount Van Hoevenberg is remarkably good, especially for ski skating. More snow is on the way tonight so conditions should just get better.